When you are as rich as the fictional industrialist Bruce Wayne, then I am quite sure you can just about do anything you like with your hard earned money without having anyone condemn or judge you. Hey, if you want to blow $35,500 on the Gotham Golfcart, by all means go ahead and do so. 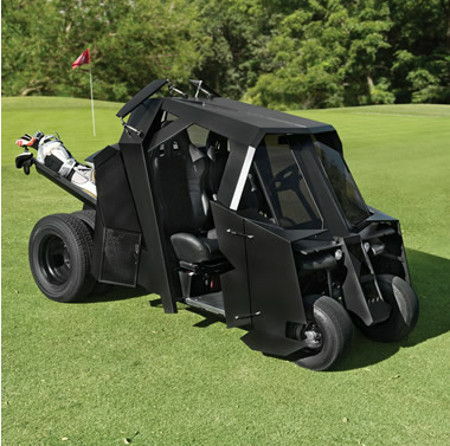 This is one golf cart that has been specially inspired by the Tumbler, which is the vehicle ridden by the iconic caped superhero from the 2005-2012 Dark Knight movie series. It will allow you to avoid sand traps and water hazards in style, just like how Batman made short work of the police and roadblocks in the movies. The Gotham Golfcart will roll across the green on six course-friendly tires, where the back four happen to be smaller 28″ versions of the originals from the movie vehicle. It will run on a 6-horsepower, battery-powered electric go-cart motor, with the cart being able to hit a top speed of 38mph for quick follow-up shots or to retrieve an errant slice. It comes in Bruce Wayne’s favorite color – black, and sports an all-black alloy body that will feature twin aerodynamic wings that fold around the passenger compartment in order to protect occupants from incoming golf balls. To ensure a smooth ride, there is a 4-link rear suspension accompanied by rear disc brakes that deliver confident stops.